Judge Judy is known for being a no-nonsense television Judge who makes decisions in small claims cases in front of an audience, and the shows are televised. Recently, the judge had a case in front of her where a dog’s ownership was in question by two different individuals. A woman was claiming the dog was hers and the man who bought the dog from someone off the street was claiming it was his dog. The lady in the case brought out veterinarian records to attempt to sway the judge that she was the true and lawful owner of the dog. Judge Judy immediately lets her know that the documents she provided do not prove that the dog in question is hers. Judge Judy requests that the woman is holding the dog to release the dog into the courtroom. The woman continued to keep the dog until the judge then demands that they place the dog on the ground. The woman then released the dog. When they put the dog on the ground, the pup immediately ran to the man who was the defendant in the case and was jumping on him and giving signals to everyone in the courtroom that the man was his owner. Witnessing the interaction between the man and the dog, Judge Judy immediately showed that she knew the man was the real owner of the dog. Judge Judy then made her ruling citing that the man was the owner of the dog and that he had won the case. 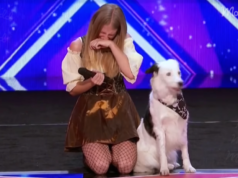 The audience was emotional as the man was crying while the dog continued to shower him with love. If you are a fan Judge Judy and her case about this precious dog, then share it with your friends so they can experience the unconditional love shown between the dog and the real dog owner. Join the discussion below. Let us know what you think about Judge Judy’s call the comments section below. Did she do the right thing despite the woman’s proof and vet bill receipts?